Yesterday was another awesome day filled with nourishing, high energy, raw vegan food that makes me feel on top of the world. When I eat raw food, I feel electric! Unstoppable! Awesome! 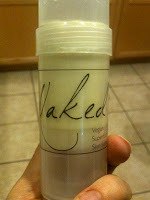 And, I’m giving my baby the healthiest breastmilk in the world! 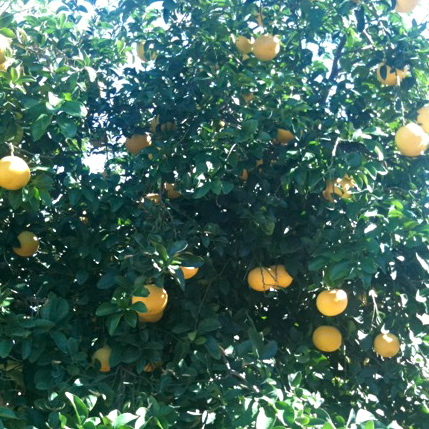 1 pink grapefruit. 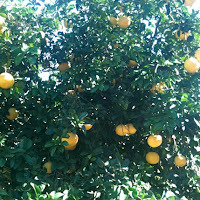 I started the day with a fresh picked organic pink grapefruit from my mom’s yard. I just love growing our own food. It’s something I’m going to work on this year more… for 2011. 3 cups of fresh organic green juice. I made the same recipe that I had yesterday. 1 Mexican Cracker. I made a batch of Mexican Crackers and they’re super great! 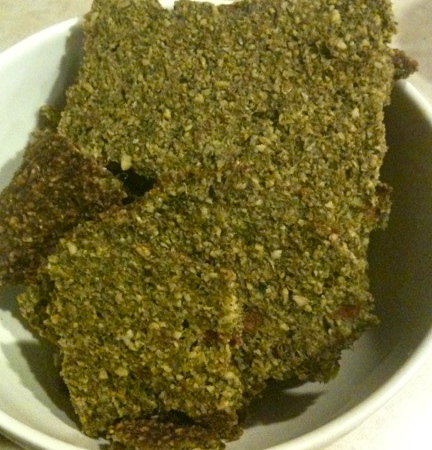 I love making my own raw crackers… so much cheaper than buying them in the store (although I still do that sometimes – lol). 3 cups of fresh organic green juice. Same recipe as above. Protein shake. This shake was water, Sun Warrior Raw Brown Rice Sprouted Protein Powder, Hemp Protein Powder, cinnamon, and the homemade curry powder recipe I made the other day. We went to visit our very good friends over at Blackbird Naturals where there shared their delicious raw vegan truffles (I had 2) and a cup of tea! 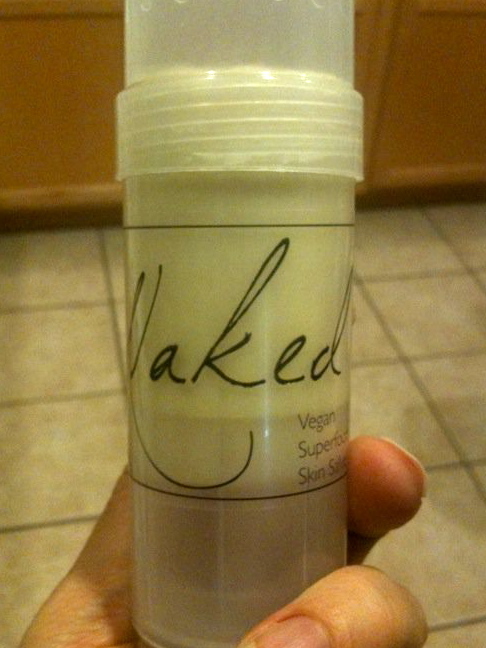 And, I was given a stick of their Naked Vegan Superfood Skin Salve (vanilla). Oh my heavenly! I loved it all! The Naked stick is so fun to use, too. The founders of Blackbird Naturals are the most amazing and loving people… every one of their products is made with pure love. I don’t want to get all mushy-gushy here, but I have to share that these people truly put love in everything they do. They have a beautiful energy and I’m honored to know them and their products speak volumes! Try them, you’ll see for yourself. I brought them a Rudolph Cherry Cobbler (recipe in my Holiday raw recipe book) – Here is a picture of the crumble while I was making it. I didn’t have any of this, but left it with them for their New Year’s Eve celebration. Back to my day of food…. 1 Pure Bar – blueberry. I’m really enjoying the Pure Bars. I love the cranberry orange, trail mix, and chocolate flavors. I liked the blueberry as well (although not my favorite but still very good), and I’m looking forward to trying their other flavors. 1 Nut Pate Wrap. I soaked raw almonds and sunflower seeds and then processed them in the food processor with fresh oregano and rosemary herbs from Blackbird Naturals’ garden, red onion, Himalayan crystal salt, celery, and wrapped it in a giant collard green with diced kiwi. 1 protein shake. Sun Warrior Protein Powder with lots of cinnamon added. I ended up a little hungry as midnight struck, but I was too tired to get up and eat anything. As a breastfeeding mama, I need to keep my calories up – although all of my calories were mega nourishing so that’s good. 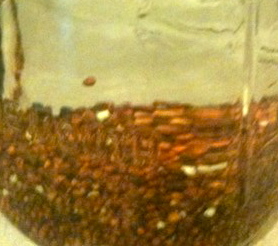 Oh, and I also soaked seeds to grow organic broccoli sprouts. I haven’t done a lot of sprouting lately but I’m going to get back into it. Tomorrow I’ll also start alfalfa sprouts. Sprouted foods are so nutritious, living, and full of energy. I’m also going to start the process of soaking/dehydrating buckwheat today to make Cinnamon Banana Crispies (recipe in my Transitions book) and well as soaking raw almonds to make a big batch of raw vegan almond milk. Bring on the healthy 2011 with fresh whole raw and vegan foods!!! PS. I’ll be sending out an email newsletter in the next week so sign up here if you’re not already a subscriber.